I love fiction that includes some political intrigue/espionage, and if it is a mystery/thriller that’s all the better! Cold War timeframe is great if done well (I loved Jake Tapper’s Hellfire Club, for example). 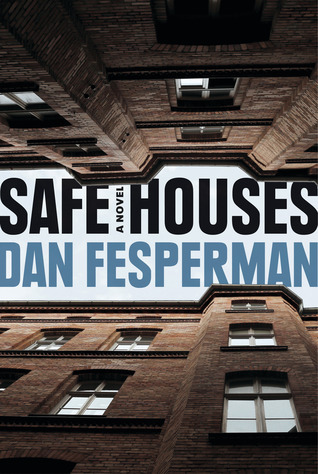 So Dan Fesperman’s Safe Houses seemed right up my alley, especially as it was praised by Lee Child as being "One of the great espionage novels of our time," so I was happy to write an honest review in exchange for a copy of this book from Knopf Doubleday and NetGalley. TBH, at first I had I love fiction that includes some political intrigue/espionage, and if it is a mystery/thriller that’s all the better! Cold War timeframe is great if done well (I loved Jake Tapper’s Hellfire Club, for example). So Dan Fesperman’s Safe Houses seemed right up my alley, especially as it was praised by Lee Child as being "One of the great espionage novels of our time," so I was happy to write an honest review in exchange for a copy of this book from Knopf Doubleday and NetGalley. TBH, at first I had a bit of a hard time getting excited about the story. Set in Berlin in 1979, the story involves a young woman named Helen Abell, who works for the CIA a network of safe houses. She is upstairs at one of the houses, having just checked the audio equipment to be sure it is working, when she begins to overhear conversation between two unexpected visitors to the safe house. The story rolls along through four chapters, when WHAM! we get one of those bombshells that makes you HAVE to read on. But as chapter 5 begins, it is 2014 and there is a man named Henry Mattick in Poston, MD, doing – well, we aren’t sure quite what, and despite some tantalizing clues, his purpose isn’t clarified for quite a while (to say the least). Henry is there at the time of a horrible double murder, and then the story just explodes. The book moves the two stories along, back and forth between locations and timeframes, and Henry becomes immersed in the double murder, when the daughter of the victims (her parents) hires him to find our why her brother was driven to shoot their parents in their bed. It’s impossible to discuss it further, either in terms of plot or structure, without committing the sin of spoilers, but I will say that -- similar to Jake Tapper’s Hellfire Club -- the afterword for Safe Houses KNOCKED ME OUT. This is my first espionage thriller story that I’ve read. I was gripped by it but found it slightly too long and I did get confused with all the agent names and code names!! Set in 2 timelines, Berlin in 1979 where Helen looks after the safe houses. She finds herself in the wrong place at the wrong time when she overhears a conversation that will put her life in danger. In 2014 Helen and her husband are murdered, her daughter Anna strives to find out what her mother had been involved in all those This is my first espionage thriller story that I’ve read. I was gripped by it but found it slightly too long and I did get confused with all the agent names and code names!! In 2014 Helen and her husband are murdered, her daughter Anna strives to find out what her mother had been involved in all those years ago, bringing danger to her door. This book is full of action and nail biting tension. Thank you so much Knopf for providing my free copy of SAFE HOUSES by Dan Fesperman - all opinions are my own. This espionage thriller is told in dual timelines, alternating between 1979 and 2014. It starts off in postwar Berlin, where Helen Abell oversees safe houses for the CIA Network. One night she enters one of the houses and inadvertently stumbles across something horrible and has the tapes to prove it. Fast forward thirty five years to 2014 where there is an arrest for a double murder. Hele Thank you so much Knopf for providing my free copy of SAFE HOUSES by Dan Fesperman - all opinions are my own. This espionage thriller is told in dual timelines, alternating between 1979 and 2014. It starts off in postwar Berlin, where Helen Abell oversees safe houses for the CIA Network. One night she enters one of the houses and inadvertently stumbles across something horrible and has the tapes to prove it. Fast forward thirty five years to 2014 where there is an arrest for a double murder. Helen and her husband are tragically killed at their farm in Maryland and their daughter is looking for answers. These two compelling storylines eventually intersect and lead to one incredible ending. Fesperman’s writing is top-notch and I am impressed with how well he seamlessly switched back and forth between the two timelines. The plot is original and I love Helen as a character. The male dominated time period seemed spot on for a woman working for the CIA in the 1970s and I especially enjoyed those chapters within the historical backdrop of Berlin. Switching perspectives between Helen in the seventies, and her daughter Anna looking for answers to her mother’s murder in 2014, made this a true page-turner. Another aspect I loved are the clever female characters and how they persevere through a male dominated field. I haven’t read many spy thrillers, but Fesperman’s style has convinced me to read more. I’m afraid they have a lot to live up to. Safe Houses is an enjoyable dual timeline story that delves into the CIA’s operations in Berlin during the later years of the Cold War. In 1979, Helen Abell oversees the safe houses that the CIA maintains in Berlin. One night she accidentally overhears a strange conversation in one of the houses and then subsequently stumbles into another dangerous encounter. Abell decides to expose those responsible which leads to a decades long vendetta that has severe consequences in 2014 when a son is arrest Safe Houses is an enjoyable dual timeline story that delves into the CIA’s operations in Berlin during the later years of the Cold War. In 1979, Helen Abell oversees the safe houses that the CIA maintains in Berlin. One night she accidentally overhears a strange conversation in one of the houses and then subsequently stumbles into another dangerous encounter. Abell decides to expose those responsible which leads to a decades long vendetta that has severe consequences in 2014 when a son is arrested for the double murder of his parents. As the story progresses, the two tales slowly intersect and weave into a powerful conclusion. My favorite part of the story was the description of Berlin in 1979. The wall is still in place, but much of the United States’ focus has shifted to the Middle East and the tensions in Iran. Fesperman effectively conveys the tension still present in bifurcated Berlin, but also the sense that the worst has passed there. Safe Houses was an engaging and entertaining read. Dan Fesperman can write, I'll certainly give him that. His 'Safe Houses' is one of my recent favorites, with both fine writing and a great plot. 'The Prisoner of Guantanamo' is likewise well-crafted, but the plot, although interesting and quite tricky, is a bit muddled. It's one of those books where you struggle to figure out what's really going on as the main character is doing the same. Falk, the lead character, is an ex-Marine working for the FBI as an interviewer of detainees at Gitmo back in Dan Fesperman can write, I'll certainly give him that. His 'Safe Houses' is one of my recent favorites, with both fine writing and a great plot. 'The Prisoner of Guantanamo' is likewise well-crafted, but the plot, although interesting and quite tricky, is a bit muddled. It's one of those books where you struggle to figure out what's really going on as the main character is doing the same. Falk, the lead character, is an ex-Marine working for the FBI as an interviewer of detainees at Gitmo back in the early aughts. He's fluent in Arabic, which automatically makes him suspect in the eyes of the military guys on the base (one really positive aspect of the book is its educational aspect... I knew little about Gitmo and now know a lot more). He has a young Yemeni prisoner he's working on but is pulled into the investigation of the drowning of an American soldier who is found washed up on the beach on the 'wrong side' of the fence- in other words, in Cuban territory. The base commander wants results, but so do the various other acronyms (CIA, FBI, JIG, DHS....) who descend on Gitmo in short order. There seems to be a spy-hunt going on, but there's also an unusual level of interest in the drowning investigation. Original and entertaining espionage thriller! Dan Fesperman - Dan Fespermans travels as a writer have taken him to thirty countries and three war zones. Lie in the Dark won the Crime Writers Association of Britains John Creasey Memorial Dagger Award for best first crime novel, The Small Boat of Great Sorrows won their Ian Fleming Steel Dagger Award for best thriller, and The Prisoner of Guantnamo won the Dashiell Hammett Award from the International Association of Crime Writers. He lives in Baltimore.